G’FIVE has blown a loud whistle on this one, launching a new media compression technology based in their new mobile phone devices, G’FIVE Movie King E680, E650 and E620 models come with a 4GB data card preloaded with 20 full-length movies, 20 ringtones and 5 FTV videos. ( FTV Videos ? – Really!). The G’FIVE Movie King E620 has all of the above plus analog TV reception. G’FIVE Movie King E650 on the other hand is a stylish flip phone with touch screen, and a bigger 6 cm (2.4”) QVGA display. G’FIVE innovates for the masses yet again! New Delhi, September 10 , 2011: G’FIVE Mobile, one of the top 10 mobile phone brands globally (as per Gartner’s Worldwide Mobile Device Sales to End Users in 2Q10); the second largest selling mobile phone brand in India (as per the IDC’s India Quarterly Mobile Handsets Tracker, 3Q 2010); and also the fastest growing mobile phone brand in India (as per V&D 100, June 2011) today announced the launch and availability of its new compression technology breakthrough and gaming wonders. G’FIVE G20, the new gaming wonder from the brand, comes preloaded with 1000 video games from the most popular family of 16-bit games like Mario, Contra, Tetris, Goonies, Battle City etc. To further enhance customer’s gaming experience, the handset comes bundled with a gaming console which is akin to the remote control of other gaming devices. The G’FIVE Movie King E680 is a dual-SIM dual standby handset which comes with a 5.5 cm (2.2”) QVGA display and multimedia features like dual camera, built-in Yamaha amplifier for surround-sound effect, FM radio player, music player, video player, a 3.5 mm universal audio jack besides short range wireless connectivity. The G’FIVE Movie King E620 has all of this coupled with analog TV feature as well. While the G’FIVE Movie King E650 is a stylish flip phone with touch screen, and a bigger 6 cm (2.4”) QVGA display. The G’FIVE G20 gaming phone is also a dual-SIM dual standby phone loaded with multiple features. It has a gaming simulator with 1000 games, 6 cm (2.4”) QVGA display, dual memory card slot, analog TV, built-in Yamaha amplifier, universal 3.5 mm audio jack, music player and audio player besides short range wireless connectivity. “We strongly believe that the benefit of the technology should not be limited to a few but must be available to the masses. Our business philosophy is to make technology affordable to the common people. We not only are offering compelling products at a most competitive price but we have also set up widest after sales service network in the country. We have over 500 fully operational after sales service centers across the country and we do offer a warranty of 500 days against the industry standard of 365 days,” adds Mr. Pathak. 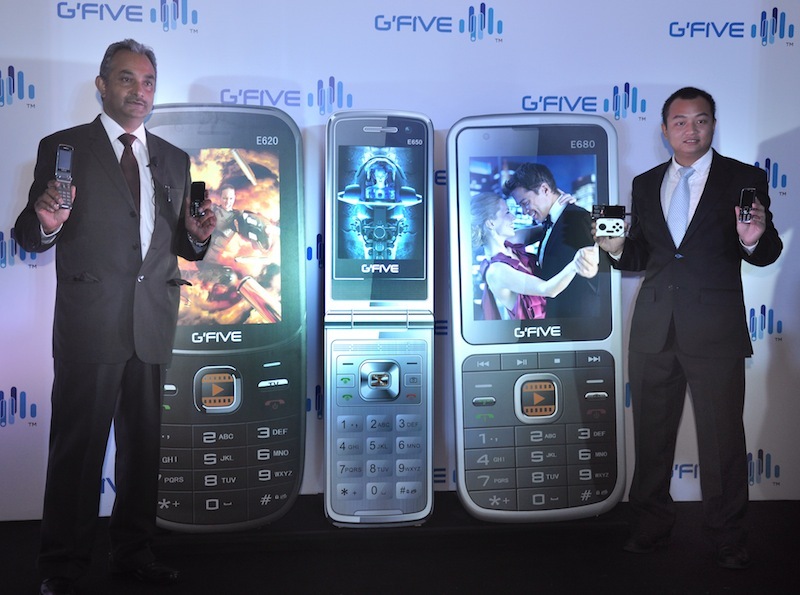 Owing to the immense value for money proposition that the brand brings across for the customer via its in-house design and development facilities and manufacturing facilities in China, resulting in economies of scale and therefore affordability sans any compromise on aesthetics and features, G’Five has become the most exported brand of mobile phones out of China ever since its inception seven years back. Some other innovations introduced by the brand for the very first time in the market include marathon battery for really long talk time and standby time (up to 2200 mAh), steel body, super-slim design etc. Select models from the brand are loaded with top-of-the-line features like IPTV, push mail, triple SIM (GSM + GSM + CDMA), dual LED torch, expandable memory up to 16 GB, voice changer, motion sensor / song changer, flip form factor with QWERTY keypad, navigation wheel, butterfly lights etc. G’FIVE mobile has made large investments into R&D, product design and manufacturing facilities and always shares the benefits it accrues because of economies of scale with its customers. Also the capabilities it has built to launch new models at the shortest possible time keep it ahead of the competition. It has already launched over 300 mobile phone models and has the capabilities to spin out 2 new exciting models every week from its labs into the market. Along with Android mobile phones and tablet PCs, G’FIVE has ambitious plans for launching other consumer electronic products in 2011 as well, including net books, laptops, music boxes etc. All of these shall provide G’FIVE users with a comprehensive spectrum of products and essentially, a splendid user eco-system and digital experience. G’FIVE has presence in more than 180 countries including China, Taiwan, India, Indonesia, Vietnam, Thailand, Nepal, Bangladesh, Pakistan Dubai, Egypt, Nigeria, Kenya, Cote d’Ivoire, Cameroon, Congo, South Africa, Argentina, Brazil, Peru, Mexico and Bulgaria besides other emerging markets. Established in 2003, G’FIVE International now has multiple factories and assembly line operations based out of Shenzhen, China with a global operation center in Hongkong.